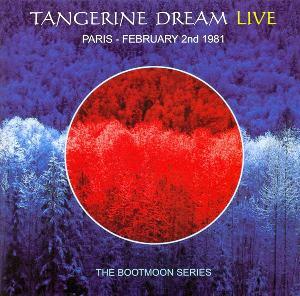 Very good release from the 1981 Paris Bataclan performance. This double CD set features great pieces not on official releases and has its place among TD top 80's live albums. The first disc starts with "Undulation", which is a live version of EDGAR FROESE's "Kamikaze" Theme. This oriental-electronic track is unique and shows from the beginning that TD is always surprising. "Calymba Caly" and "Thermal Inversion" are another little-known lengthy pieces more captivating in my mind than most tracks of the "Exit" album recorded the same year. "Parisien Piano" calms down the tempo until the end of "Force Majeure" which concludes admirably the disc. The second starts with the "Silver Scale / Horns of Doom" suite, 20 minutes of punchy hypnotic electronic sequence growing in your mind. "Phase Change" provides the transition to tracks taking themes from the "Thief" soundtrack. The reason why I give 4 stars instead of 5 is that the end of the disc seems a bit repetitive. Anyway, this double CD simply features one of the best live TD performance of the 80s and proves that the band was very creative during this period. I would have liked to see some of the tracks played here released in one of their studio albums.